Ka-thunks are obstacles that appear only in the courses King Ka-thunk's Castle and Bowser's Lava Lake Keep in Super Mario 3D World. 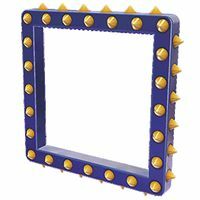 Ka-thunks resemble spiky blue square frames which hurt the player upon contact. They usually spawn in small crevices and move along a set path until they fall into an abyss. They function similarly to Tox Boxes, as they move along paths, and the player must avoid them by using the hollow space in the middle. They cannot be destroyed by any means, including invincibility, excepting the pair of Ka-thunks in Bowser's Lava Lake Keep which disappear upon defeating a pair of Hammer Bros.
King Ka-thunk uses one of these during his battle. ↑ Super Mario 3D World Prima Official Game Guide, page 27. This page was last edited on December 16, 2018, at 13:48.